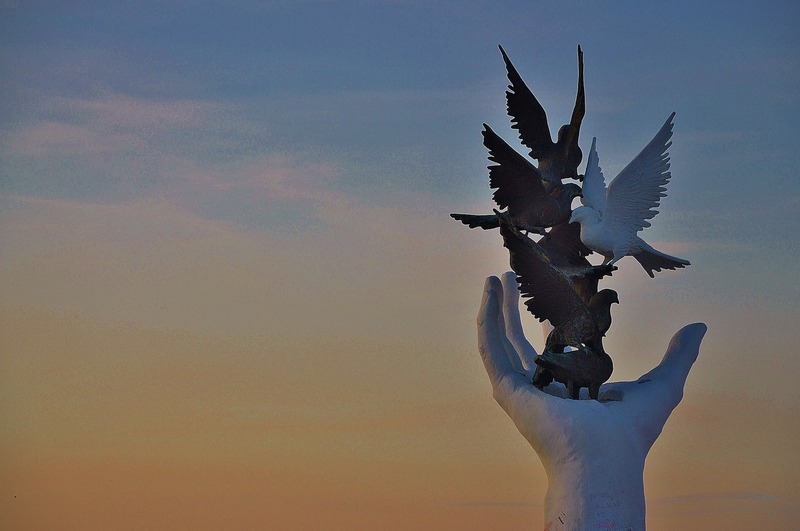 My hands turn to dove wings. the song rising inside me. Will the ground sink away from under me? come words lifting the wind. “The Song of Miriam” by Rabbi Ruth Sohn was first published as “I Shall Sing to the Lord a New Song,” in Kol Haneshamah: Shabbat Vehagim, Reconstructionist Prayerbook, 1989, 1995 Second Edition. Reconstructionist Press, pp. 768-769. (This poem was also published in several haggadot and other books and set to music by several composers in the U.S. and Israel.) Rabbi Sohn wrote the poem in 1981 as a rabbinical student after immersing herself in the Torah verses and the traditional midrashim about Miriam, and after writing a longer modern midrash about Miriam. Part of this modern midrash was published as “Journeys,” in All the Women Followed Her, ed. Rebecca Schwartz (Rikudei Miriam Press, 2001). “שיר של מרים הנביאה | The Song of Miriam, a petiḥah by Rabbi Ruth H. Sohn (1981)” is shared by Ruth H. Sohn with a Creative Commons Attribution-ShareAlike 4.0 International copyleft license. Please reciprocate for any adaptation or redistribution of this work by (1) properly attributing the work to Ruth H. Sohn, (2) clearly indicating the date you accessed the resource and whether any changes have been made (and if so, please be in touch with us and leave a comment below so that we might note your adaptation or improvement), (3) providing a link back to this source, and (4) specifying the Creative Commons Attribution-ShareAlike (CC BY-SA) 4.0 International copyleft license under which this work was shared.